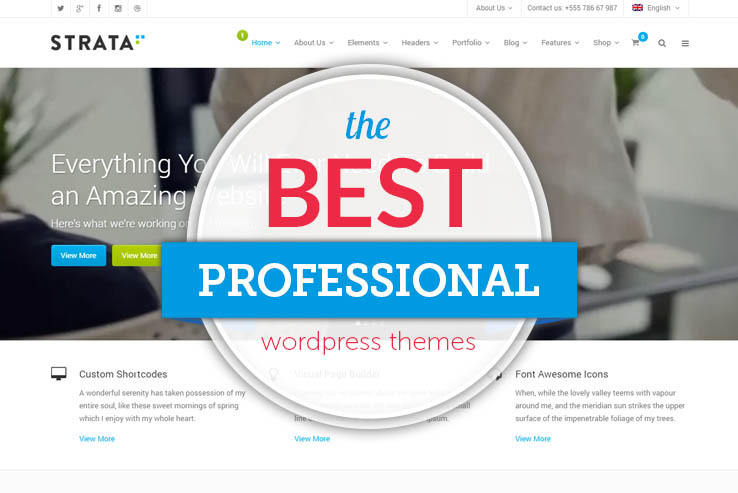 What’s a professional WordPress theme? Heck, a professional theme could be creative and flashy for bands, but a lawyer surely wouldn’t want something that a punk rock band is looking for. In terms of professionalism, we’re going to talk about themes that are more catered to companies interested in a clean, well-organized look. Creativity is still there, but the majority of content is structured in a way so that customers can easily digest it and not be blown away by risky design tactics, animations or anything else that you might not find on a lawyer’s website. That’s right, most of the options we’re going to cover are professional in the sense that a more proper business would want to use them. Think accountants, lawyers, marketing agencies and engineering firms. Sure, most of the themes can be transformed into just about anything you could imagine, but in general, the default looks are more akin to walking into a board room, as opposed to an art studio. Compared to other themes, the more professional options are going to have simpler designs, with strong, yet neutral colors and areas that focus on past work. Many of them include portfolio sections, while others are mainly built to show the world a little bit of information about the company. Since professionalism bleeds onto several types of industries, there’s no saying what other types of features are included with the themes. For example, some of them have WooCommerce functionality, while others are more focused on presenting professional looking sliders and staff profiles. Lots of the themes talked about today are essential for making your brand look respectable, so we recommend taking a moment to bookmark the ones you like, and test out the ones that really stand out. 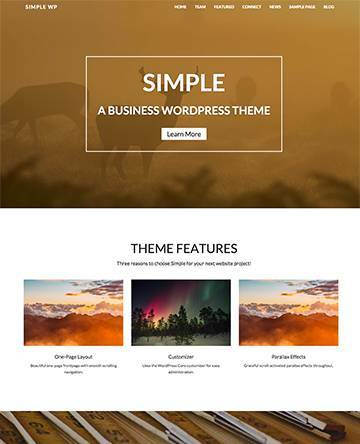 The Professional WordPress theme is one of the better options out there, with the beauty you generally get from the folks at Elegant Themes and some varied features for quickly getting a nice website up and running within minutes. The sleek and simple design is built so that you don’t get all that extra fluff that most other themes come with. The goal is to keep most of the focus on your best content, showing off your products, services, and staff members. You can share your logo at the top of the site and go straight into the stuff that matters. The prominent slider provides a clear call to action, which we particularly enjoy because just about every business looking for professionalism is also trying to make money. Sliders are known to help with sending people to other parts of a website, including landing pages and product pages. The responsive layout means that anyone can view the theme on mobile devices. There’s nothing more professional than a website that follows the rules set forth by search engines. Since Google and Bing have pretty much come out and stated that responsive websites will move up the rankings faster, you’re going to want a theme that follows those rules. Four unique colors allow you to make your branding look more unique. Localization files are included with the Professional WordPress theme, giving you the potential to work with clients from all over the world and the theme also includes other types of communication methods for the utmost professionalism. 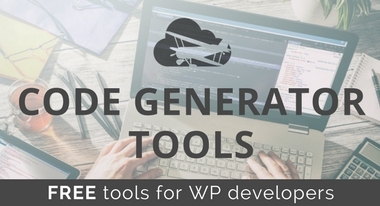 Several shortcodes come along with the Professional theme making it much faster when trying to implement items like buttons and columns. You don’t have to know a lick of code with the shortcodes. Along with ad spots, page templates, and a variety of other options to play around with on the backend, the Professional WordPress theme is a choice that all companies should look at. 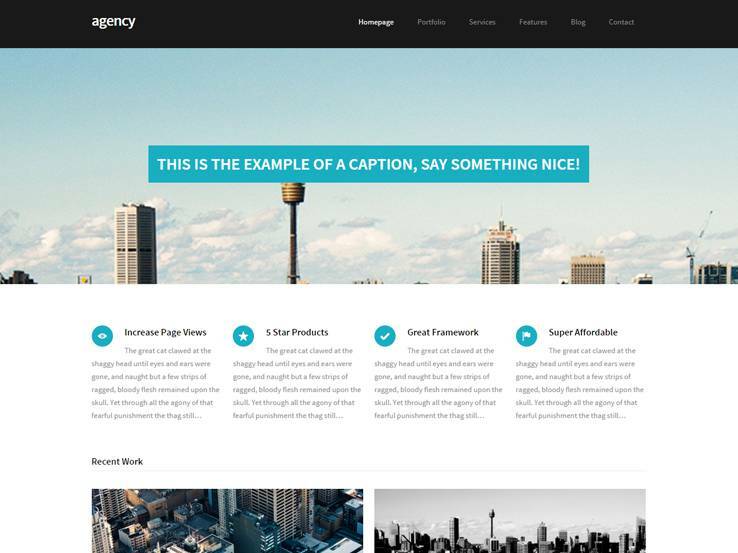 The Agency Pro WordPress theme comes from the people at StudioPress, which means that it runs on the Genesis Framework. This is one of the more professional and reliable frameworks you can go with. 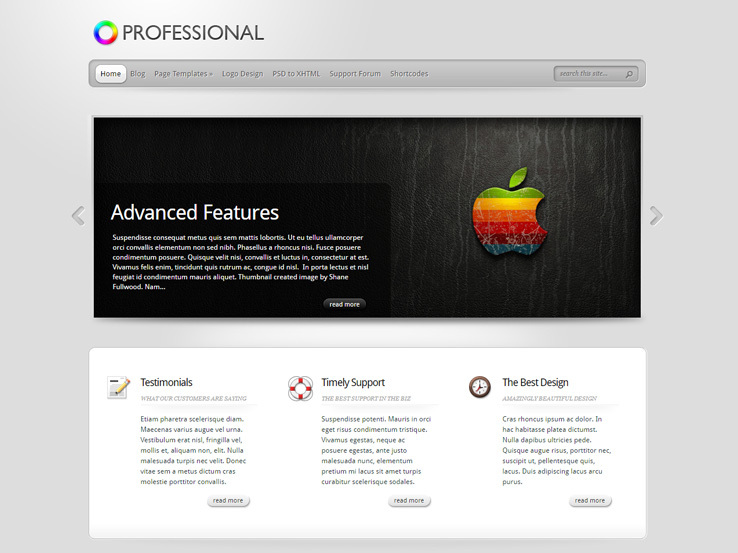 Agency Pro is mainly geared for a design agency, but you can use it for any type of business. The email subscription form is great for boosting your subscriber rates and you can showcase your past projects in an elegant grid layout on the homepage. Agency Pro has several color schemes to choose from so integrating your brand is that much easier, along with a responsive layout that looks great on smaller devices. You even get several homepage widget areas. On top of that, you can easily show your recent blog posts which help you connect with your audience and increases your visibility in the search engines. The footer is widgetized as well so you can easily include your contact information. Several social media icons are included as well which allow you to grow your online presence. On top of that, a beautiful landing page is also included so you can share a special promotion or sell a product if you have one. 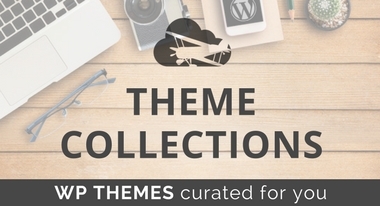 Finally, the theme has several layout options which help you add variety to your website. 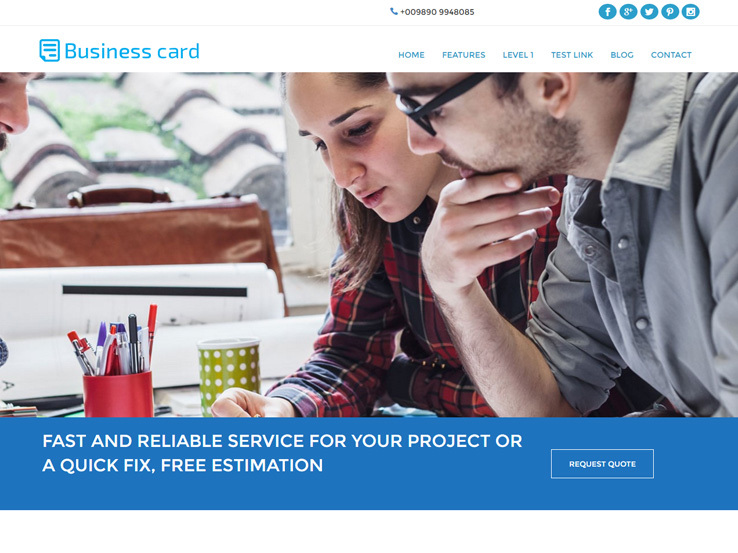 With the Business Card WordPress theme, you gain access to a stunning website design with a knack for helping you improve your online identity. The theme is completely responsive for when one of your customers comes to your site on a mobile device and the responsive slider is ideal for when you would like to put a few banners in the header that announce anything from events to products. Shortcodes are included with the Business Card WordPress theme, all of which help out when you’re trying to make something like a button or column. Several color variations are included as well and you can choose from multiple options and combine these with the Google Fonts. Custom menus and widgets are huge bonuses and solid translation files are there for when you would like to reach out to people who don’t necessarily speak your language. Think about all of the users you miss out on when you only have your website in English. This is a huge benefit for companies, regardless of where they are located. Another cool part of the Business Card WordPress theme is that you gain access to several call-to-action buttons. These can be placed anywhere your homepage so that you can send people to different places on your website. 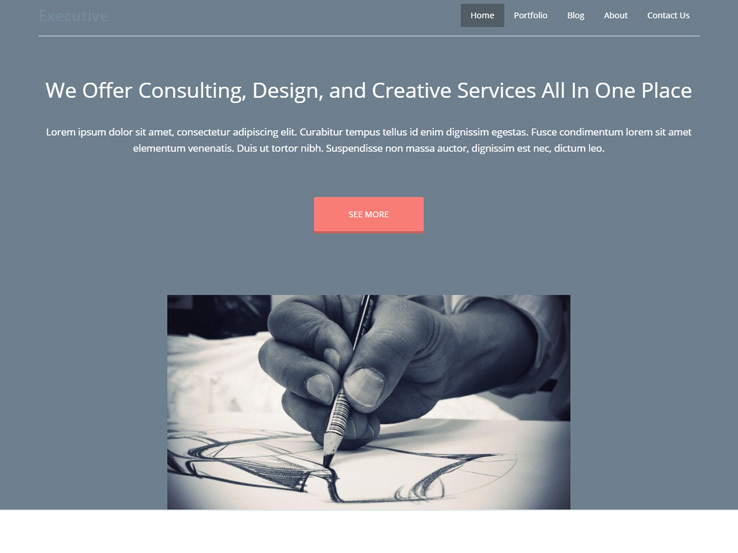 Overall, it’s a solid theme with plenty of options for your business. 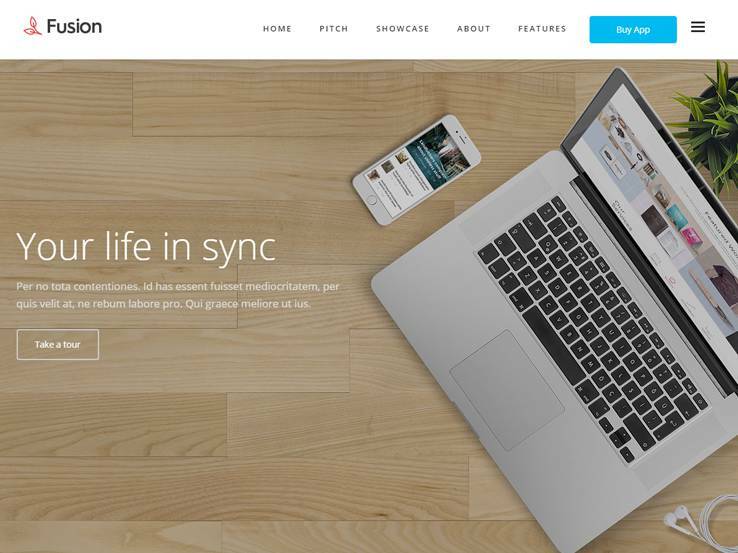 The Fusion WordPress theme comes from the folks at Elegant Themes and it provides a flashy presentation for startups and small businesses. 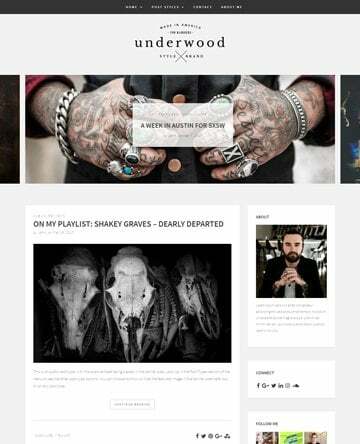 The theme has a completely responsive layout with beautiful imagery that looks great on mobile devices. In addition to that, custom backgrounds help you add a unique image that represents your brand in the best possible light. 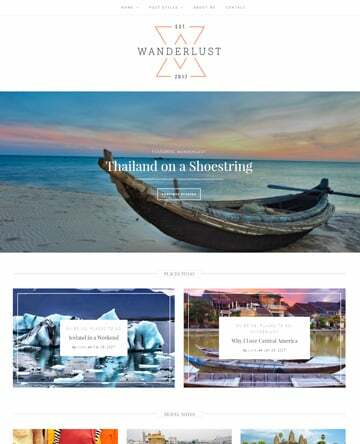 Complete localization is included with the Fusion WordPress theme, which is ideal for when you’d like to connect with people from all over the world. Another interesting part of the theme is that you get to choose from an unlimited number of colors. It all depends on what you want your brand to look like and it only takes a moment to use the color picker to find the perfect solution. Several shortcodes are included with your purchase. If you wanted to make a button or column, all you would have to do is generate a shortcode and place it on your homepage. 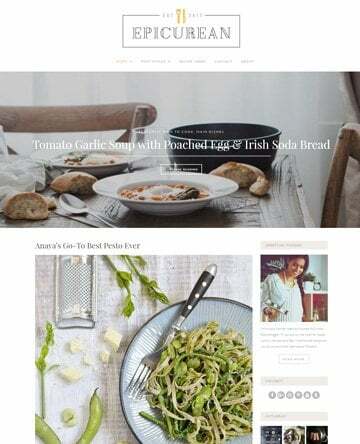 Along with beautiful page templates, a stylish design, and plenty of other website elements, the Fusion WordPress theme is one to keep your eye on. 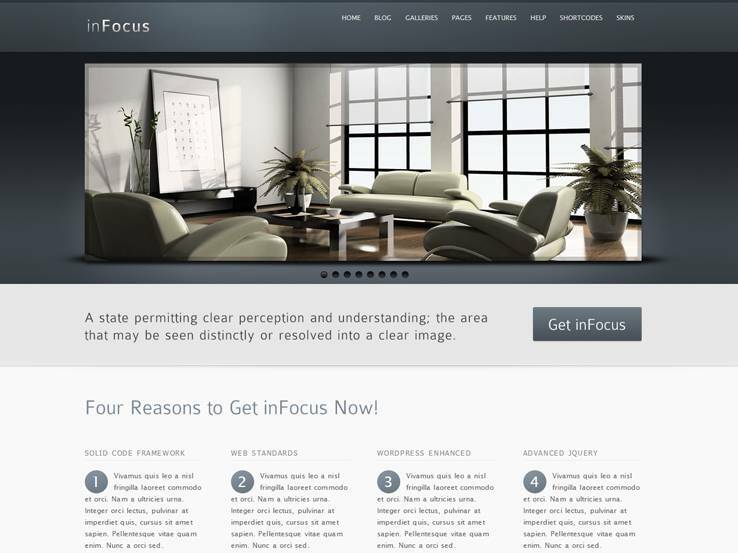 The InFocus WordPress theme is a professional theme with several sliders for adding animations, overlaying text options, and various other elements to the top of your website. Since two different sliders are offered in this theme, you have a few opportunities for connecting with customers and sharing information about your company. Some slider effects are more playful while others are more professional so you can easily use the one best suited for a particular promotion or an offer you’re trying to promote. In addition to that, over 30 skins ensure that no one is going to have a website that looks exactly like yours. This comes into play when you’re trying to find a unique brand and voice for your company. Since buying a WordPress theme seemingly guarantees that another company is going to have a similar site, you may have some reservations about the whole process. That’s where skins help out. You can typically make a completely unique website without much work put in. Along with all of these features, the InFocus WordPress theme has a wonderful contact form builder for keeping in touch with your customers. The form builder is nice because you don’t have to install a third party form builder that may potentially slow down your website. We also like it because you don’t have to pay a dime to customize your forms however you want. Choose from seven custom widgets on the InFocus theme, use hundreds of shortcodes to design elements like buttons and tabs, all without knowing how to code with HTML or CSS. The goal with shortcodes is to quickly generate simple, or sometimes, complex design elements, without the need to have any coding experience. The InFocus WordPress theme includes around seven portfolio layouts and you can present an unlimited amount of portfolios on your website. This may come in handy if you represent clients who want to host their portfolios on your site. Or, you may simply have lots of content to share with your potential clients. 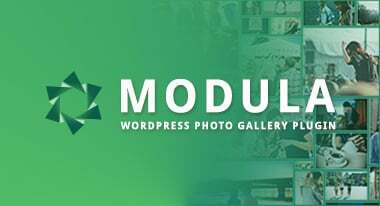 Along with layered PSDs, a shortcode generator, multiple blog layouts and more, the InFocus WordPress theme is by far one of our favorites on the list. Consider the Executive WordPress theme if you want a responsive theme that makes a great impression when showing off your services to potential customers. The professionalism is great on the backend, considering a visual customizer helps out both beginners and advanced users. You can easily drag and drop elements to where you want them to appear, while also playing around with settings that allow you to change colors and fonts. The color variations are interesting for branding, while the custom menus ensure that everyone has an easy time navigating your website. Custom page templates are around to turn parts of your site into more creative aspects, while social media buttons are essential for sending people to other platforms you have online. Overall, these social media items are branded and ready to work well on your website. Upon landing on the Executive demo, you’ll notice a beautiful portfolio for those companies that are looking for a professional way to highlight past work experience. This way, you can send off some links to potential employers and make sure that they don’t get sent to a clunky, unprofessional site. The blog is entirely customizable, with plenty of space to develop professional content for your followers. Many companies share blog posts for free, boosting search engine rankings and sharing tips, advice, and updates with their target audience. The slider in the website header has overlaying text and buttons, so you can easily promote a service or a product. All of this is customizable, so you make it as professional as you want. Talk about your services with the help of icons and columns and post testimonials from people you have worked with in the past. All of your recent blog posts can be shown on the homepage as well, which keeps users on your site for a longer period of time, while also showing them that you are constantly publishing content on a regular basis. 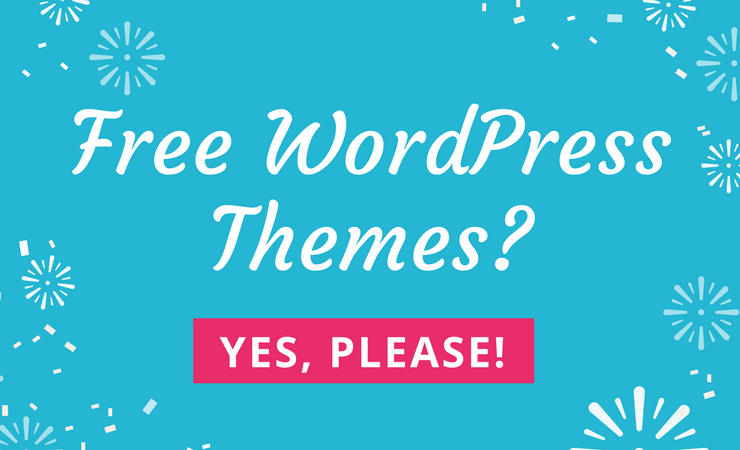 Along with plenty of widgets for things like social media, contact information, recent posts, and maps, the Executive WordPress theme comes into play for serious companies that want a legitimate platform online.